Until recently, walking into McDonald's after 10:30am and ordering a Sausage McMuffin and hash browns netted you a whole lot of disappointment, and possibly a crying child. Then McD's answered your prayers by adding All Day Breakfast. But even then, half the country could order McMuffin sandwiches, and the other half Biscuit sandwiches -- and nobody could order the breakfast pièce de résistance, the McGriddle. In a press release, the Golden Arches detailed its plan to expand the All Day Breakfast menu -- specifically, remedying that breakfast sandwich shortcoming. 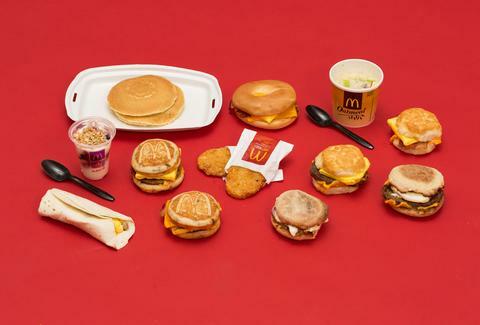 After the rollout, ADB will include both McMuffin variants and Biscuit variants, plus the McGriddles. Some believe the McGriddles to be the best item on the McD's breakfast menu. This is not true -- it's just a great way to inject maple syrup into a sandwich that lacks maple syrup. Not a bad thing -- but certainly still not the Bacon, egg & cheese biscuit. Let's not kid ourselves about this. Egg McMuffin, Sausage McMuffin with Egg, Sausage McMuffin, Bacon, Egg & Cheese Biscuit, Sausage Biscuit with Egg, Sausage Biscuit, Bacon, Egg & Cheese McGriddles, Sausage, Egg & Cheese McGriddles, Sausage McGriddles, Hotcakes, Hotcakes and Sausage, Sausage Burrito, Fruit & Maple Oatmeal, Fruit ‘N Yogurt Parfait and Hashbrowns (varies by restaurant). You'll be able to get your McGriddle on anytime starting in September. And if the sales spike provided by these McD's advancements keeps up, who knows? Maybe the McGangbang and its friends will become a regular item after all. Ryan Craggs is Thrillist's Senior News Editor. He's more of a 20 McNugs, no sauce guy. Just kidding. No sauce is just gross. Follow him @ryanrcraggs.